The Student Medical & Counseling Clinic is located on the corner of 11th and Poplar, just across the street from Meisner Residence Hall. There is patient parking (with a center issued pass) situated near the building along 11th Avenue. The Medical & Counseling Clinic will be closed for all CWU holidays. For a medical appointment, schedule on-line through the Patient Portal or call 509-963-1881. For a Counseling appointment, call 509-963-1391. Where is the SMaCC located? 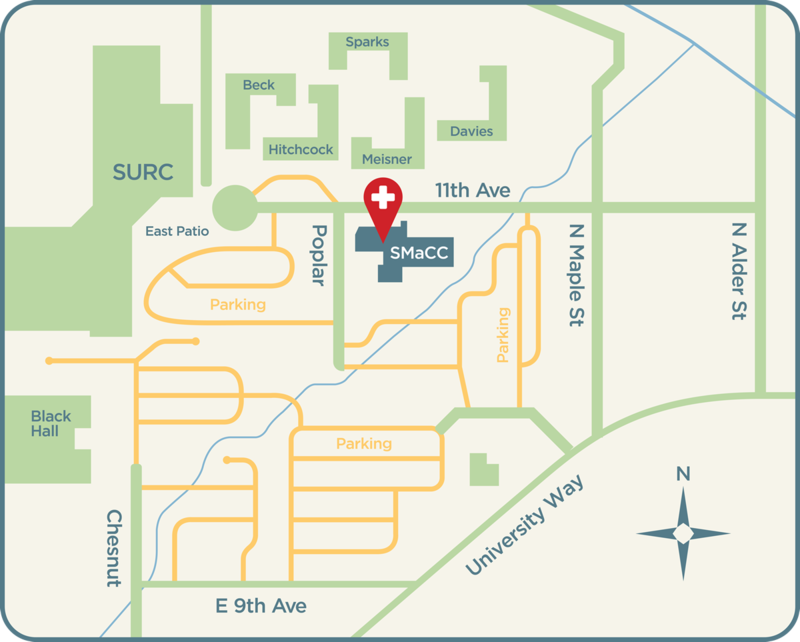 The SMaCC is located on the eastside of the Ellensburg campus at the corner of 11th Avenue and Poplar across from Meisner Hall and east of the SURC. The front entrance is at the west side of the building. Free parking is available only during the time you visit the SMaCC. A parking permit is required and is available at the reception desk.